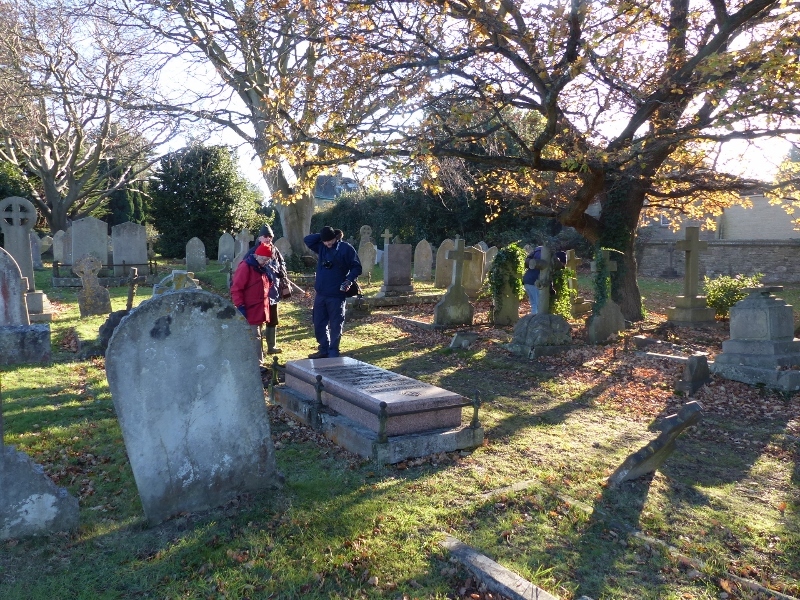 Our final foray of the season was held at Ryde Cemetery, where Jackie and myself had made some interesting finds last autumn. Nine of us met in beautiful sunny conditions but it has been cold and dry with ground frosts in the week so we were not optimistic. 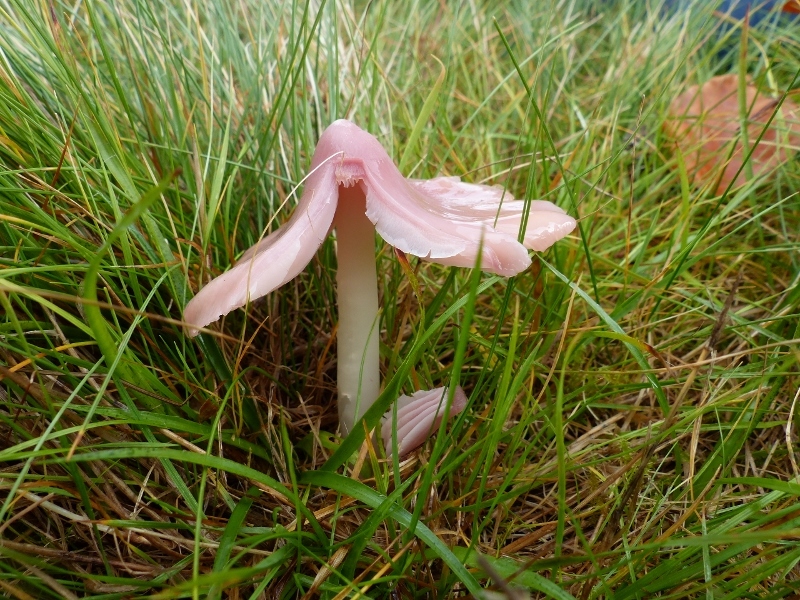 In the event, we identified 32 species, better than we thought but sadly the few waxcap fungi we found, including two specimens of the Pink Ballerina Waxcap, Hygrocybe calyptriformis, had been badly frosted. Honey Fungus, Armillaria mellea, which had been so abundant in the cemetery a month ago, was almost over. There were still a few Blewits, Lepista suaeva, and beneath an oak tree we found some late Wood Blewit, Lepista nuda, Purple Brittlegill, Russula atropurpurea and Burnt Knight, Tricholoma ustale. 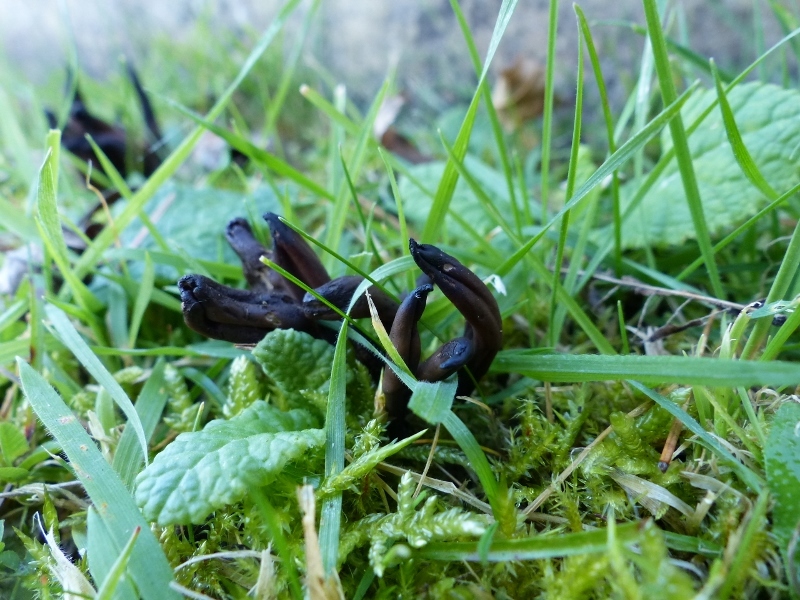 The real find of the day was a group of the rare earthtongue Microglossum olivaceum which we had only previously recorded in Northwood Cemetery and, like the waxcaps, is an indicator species of old, unimproved grassland, a habitat for which cemeteries are particularly important. We found other earth tongues in various places but, on microscopic examination, they all proved to be Geoglossum fallax. 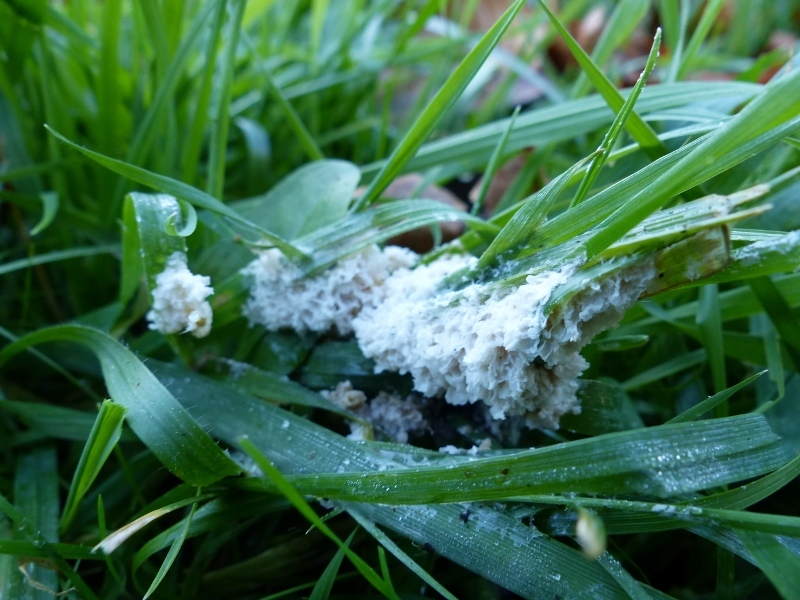 Many people remarked on the frequency of a creamy slime mould, like froth on grass. It is Mucilago crustacea. 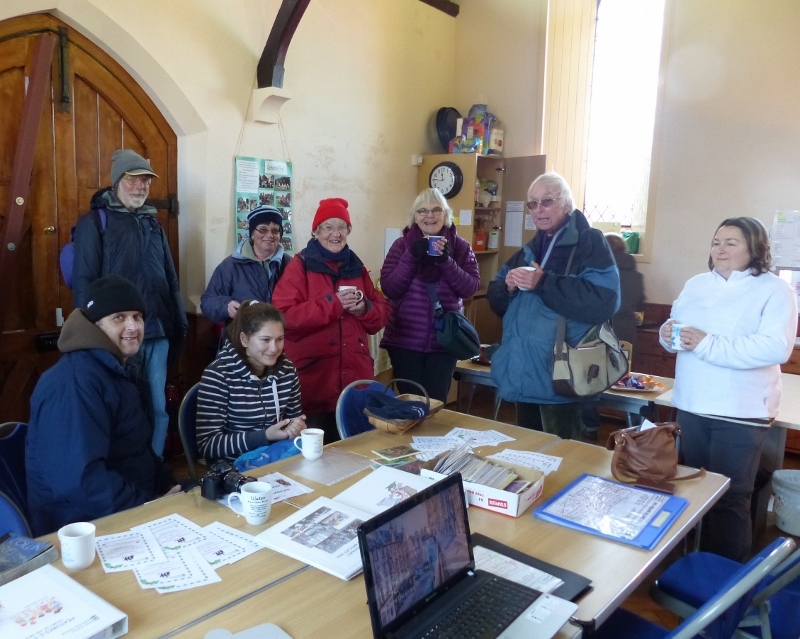 Afterwards, we were very kindly welcomed into the Learning Centre for warmth and refreshments. Thankyou Ann Barrett for making this possible. We enjoyed a mostly bright and sunny morning at Osborne, with a few heavy showers. 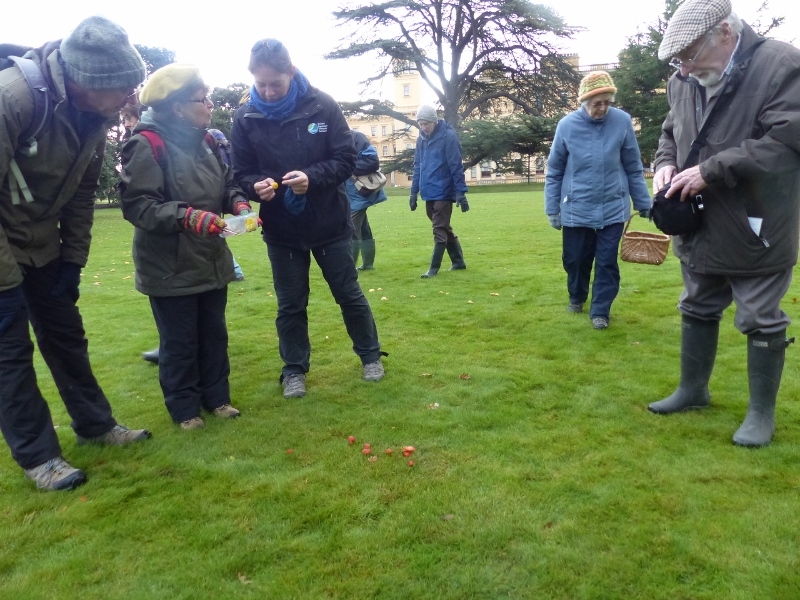 Our group of sixteen were joined by Jo and India, two of the gardeners on the Estate, who were able to direct us to where fungi were showing. 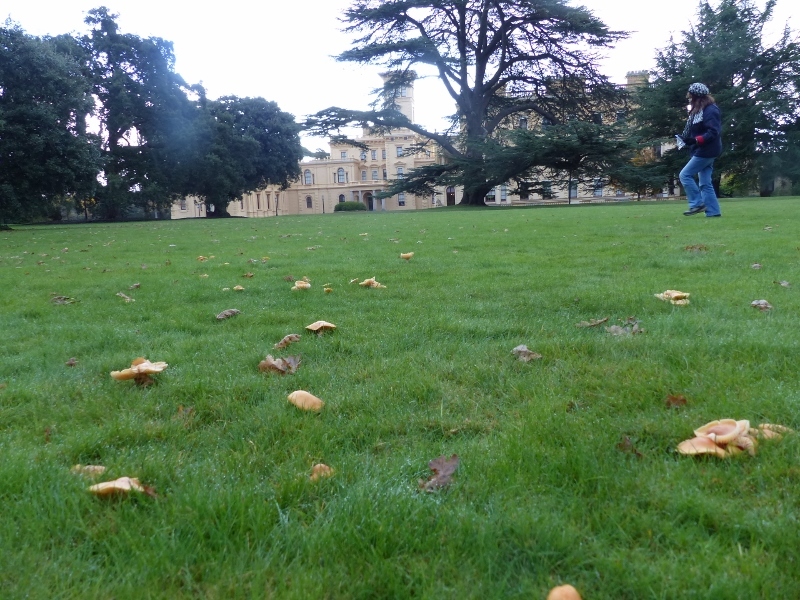 The Ornamental Garden in front of the house was a visual treat with troops of colourful waxcap fungi on the lawn. 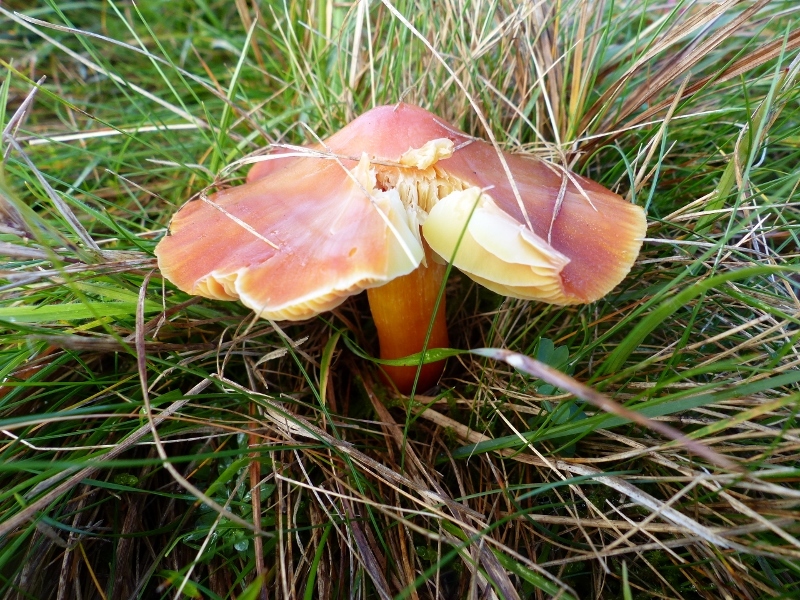 In addition to several species of waxcap (Hygrocybe spp. 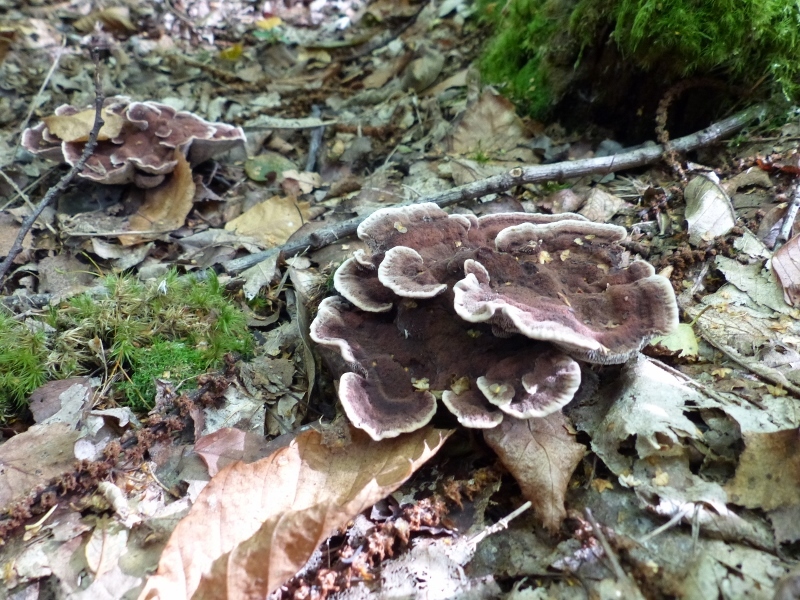 ), we found a good variety of fungi. 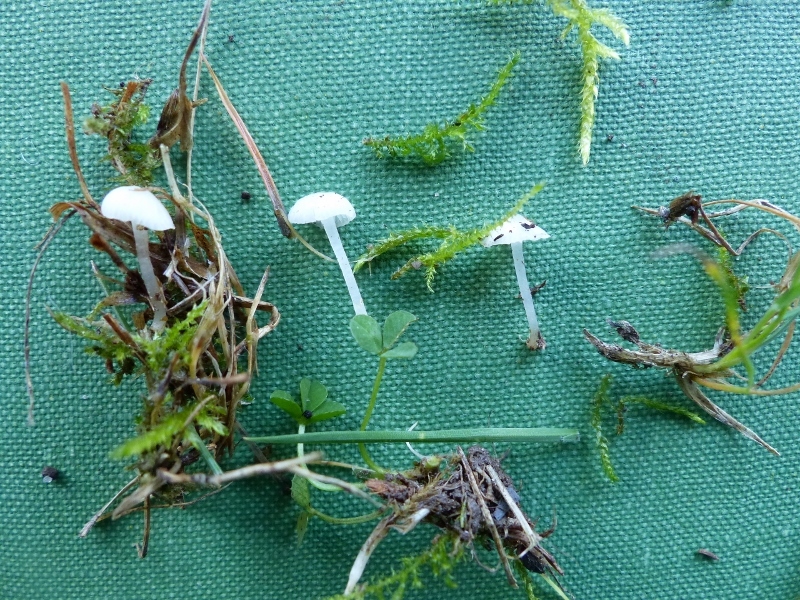 Particularly interesting were two species which we rarely record, Amanita submembranacea, a greyish Amanita with a volva but no ring on the stem (left below) , and Hemimycena delectabilis, a tiny white Mycena-like fungus growing in groups in mossy grassland (right below). On the grassy banks of the Long Walk, behind the house, we found further waxcaps including the stunning Crimson Waxcap, Hygrocybe puniceus (left below), and the pink ballerina waxcap, Hygrocybe calyptriformis (right below), bringing our total recorded to nine. On our return , we found a good selection of fungi growing on wood chip. Altogether, we were able to identify 57 species. 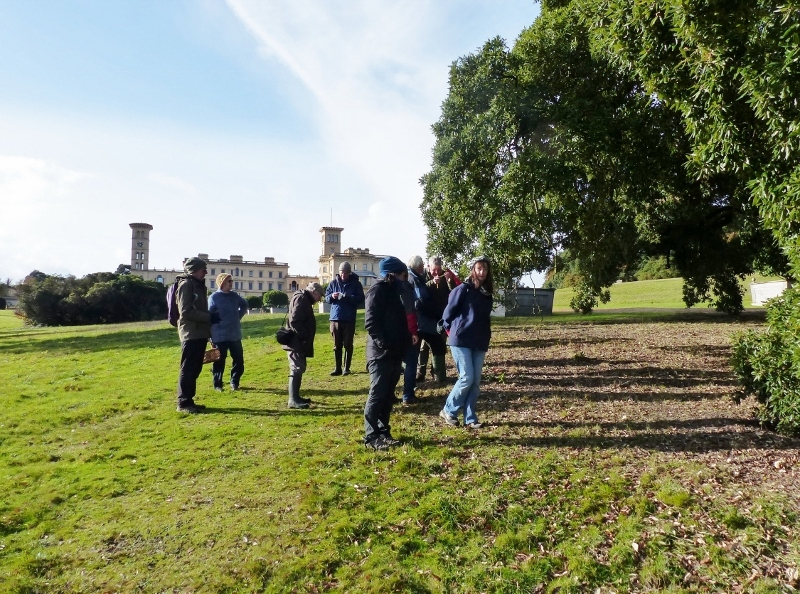 It was a bright sunny morning, but cold with touches of ground frost, when 16 of us met up to foray in the woods and amongst trees on the National Trust’s Wydcombe estate. 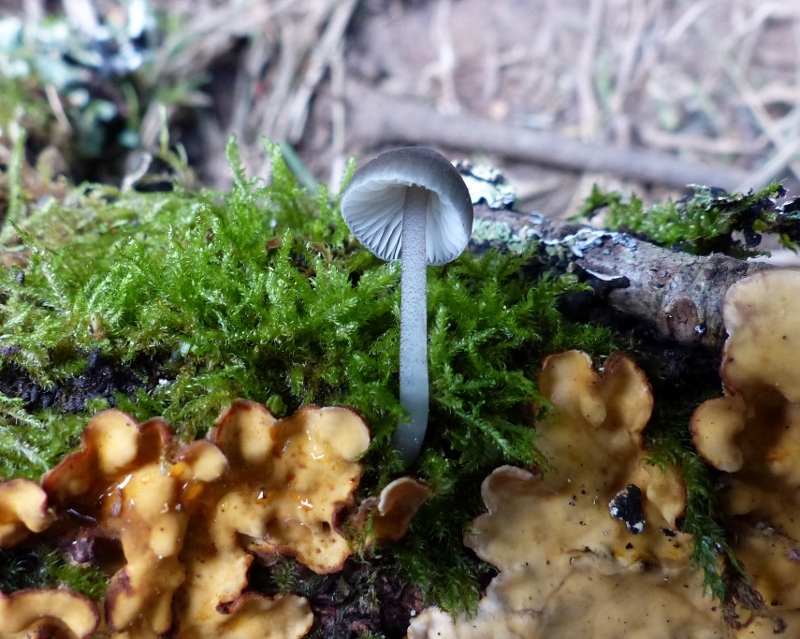 However, this autumn has been remarkable for the lack of rainfall and we struggled to find many fungi apart from those associated with dead wood and microfungi. Nevertheless, we were able to identify 54 species. 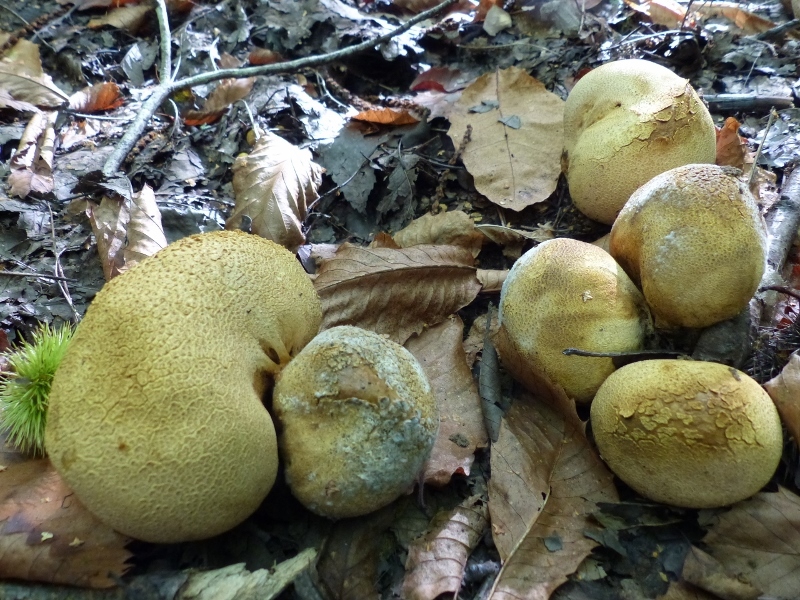 Honey fungus, Armillaria mellea, was very much in evidence. It appears to be having a ‘good’ year generally, this autumn. 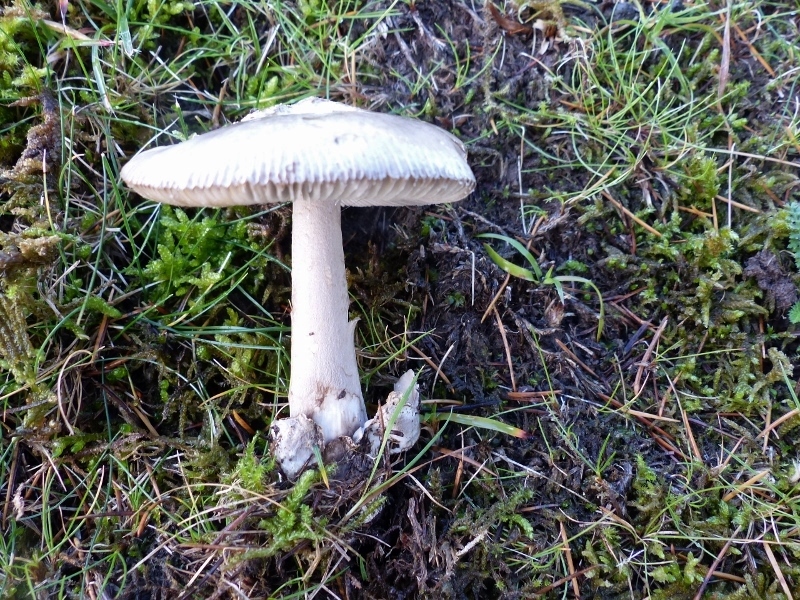 The only other large toadstool which we saw, and was much photographed, were a group of Parasol Mushrooms, Lepiota procera. Cramp balls, Daldinia concentrica, (left below) were abundant on ash. 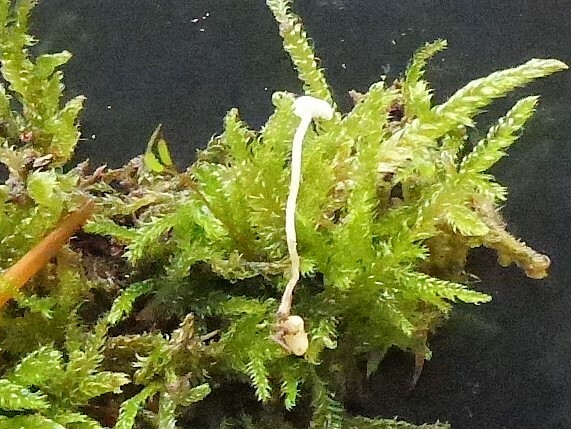 Angel’s Bonnet, Mycena arcangeliana (right below) is distinctive because of its violacaceus stipe, yellowish cap and nitrous smell on drying. 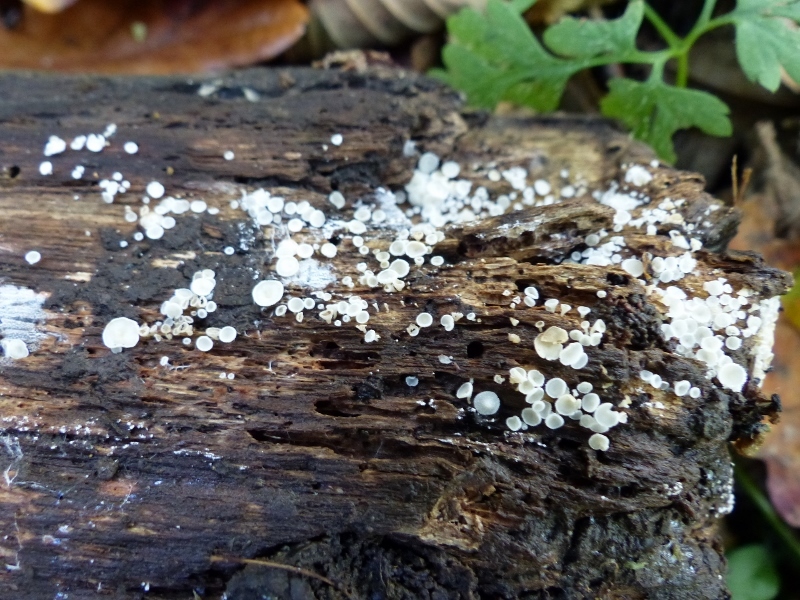 Amongst the smaller fungi we found growing on damp wood were the Dewdrop Bonnet, Hemimycena tortuosa (left below) and the Snowy Disco, Lachnum virgineum (right below), with white stalked cups. Iain and Nicky Eaton kindly allowed us access to their private woodland for our foray. Most of the conifers, including larches, from the days when the Forestry Commission owned this ancient woodland, have now been removed by the owners, leaving the native broadleaves. We found quite a few beechwood specialist fungi which we do not usually meet on our forays. Altogether, we were able to identify 75 species. 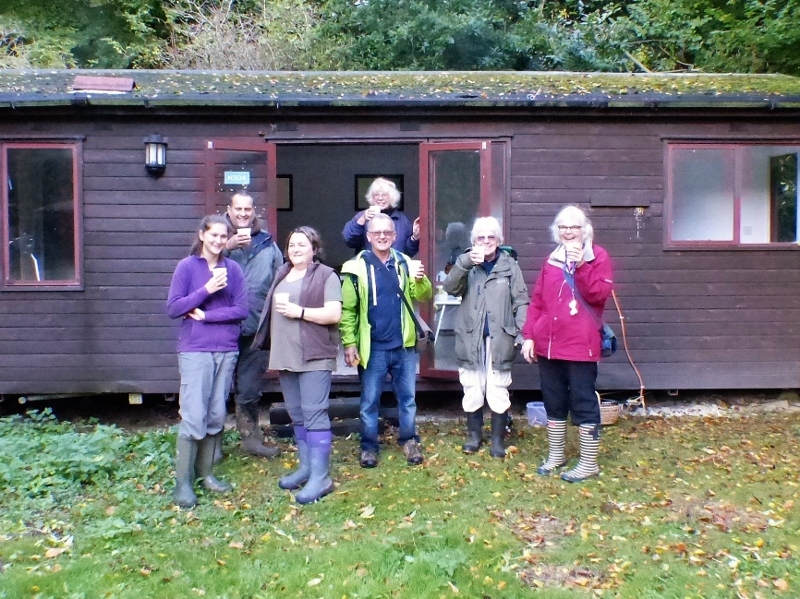 At the end of the foray, the Eatons very kindly provided us with tea and biscuits from their portacabin in the woods. Here are some of our group enjoying welcome refreshments! 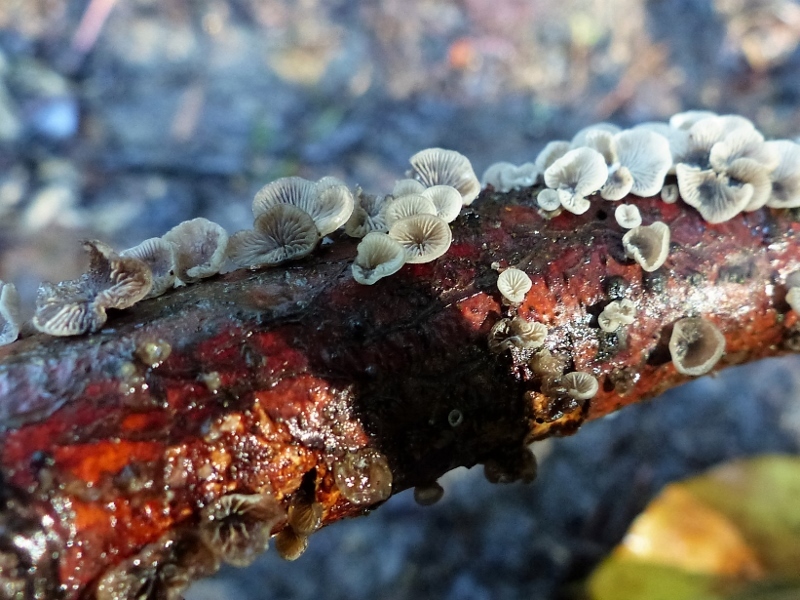 Amongst the interesting finds, we came across a beautiful little resupinate fungus clustered on twigs. This was Resupinatus applicatus (below left). Although apparently not rare, it is not something we find very often and we have only a few previous records from the Island. 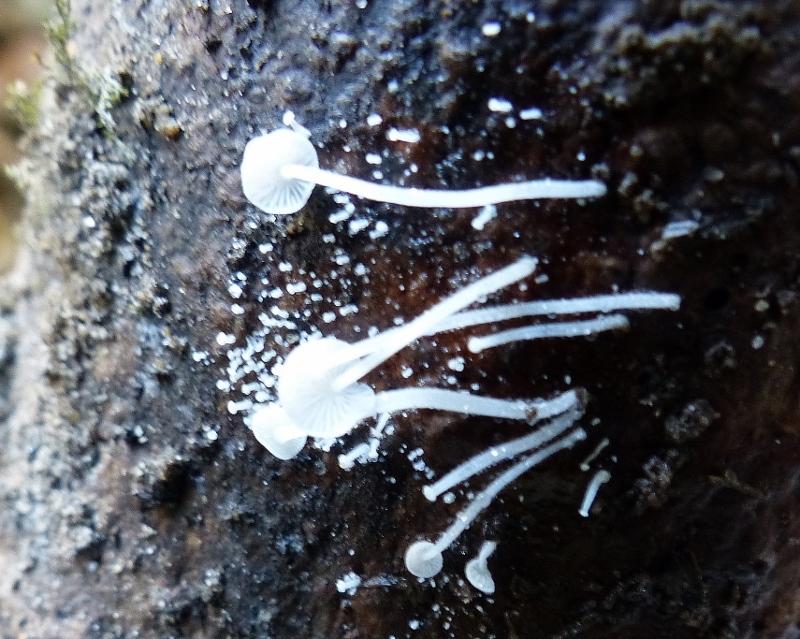 The same applies to the tiny white Mycena-like fungus which Selina found. This is in fact Collybia cookei (below right). It is notable because it grows from a yellowish structure like a bulb, technically called a sclerotium. We also found a striking medium sized Parasol mushroom, Lepiota castanea, (below left) with a chestnut coloured cap with pointed scales. This one is particularly associated with beech trees. 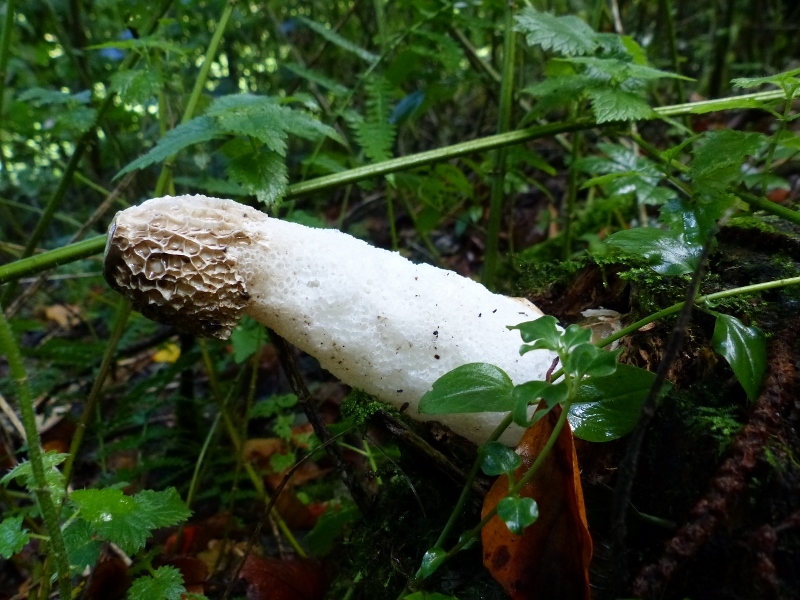 A Stinkhorn, Phallus impudicus (below right) is, by contrast, very common but we do not always fine specimens in good condition. 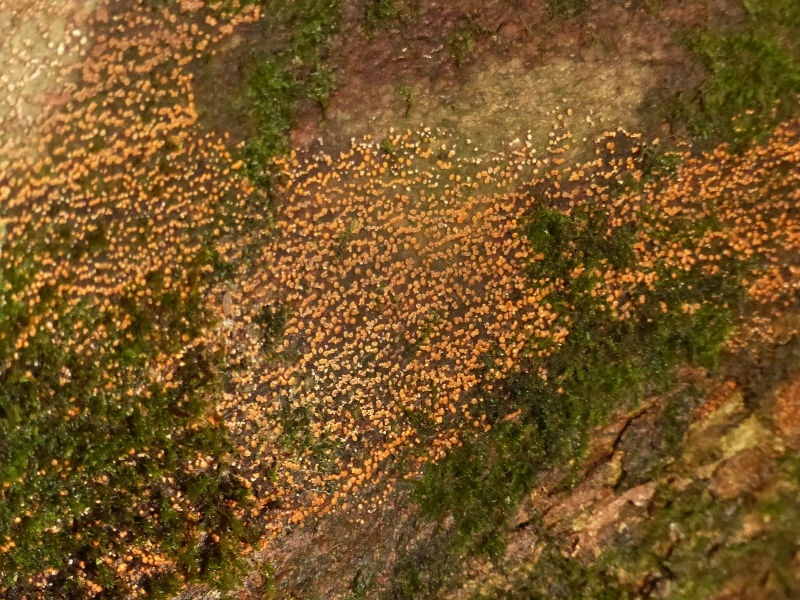 Also common is coral spot fungus, Nectria cinnabarina, a pathogen that causes cankers on broad-leaved trees. 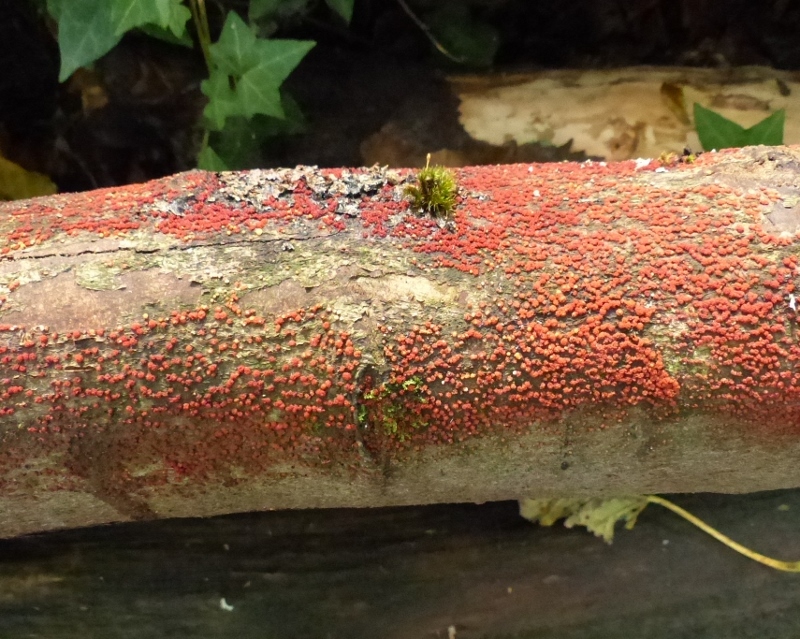 Beech is the main host of this fungus and we were impressed by the extensive spreads of it on felled beech logs. There were lots of the commonly seen bright pink pustules of the conidial (asexual) stage (left below) but also striking displays of the dark red clusters of perithecia (sexual) stage (right below). 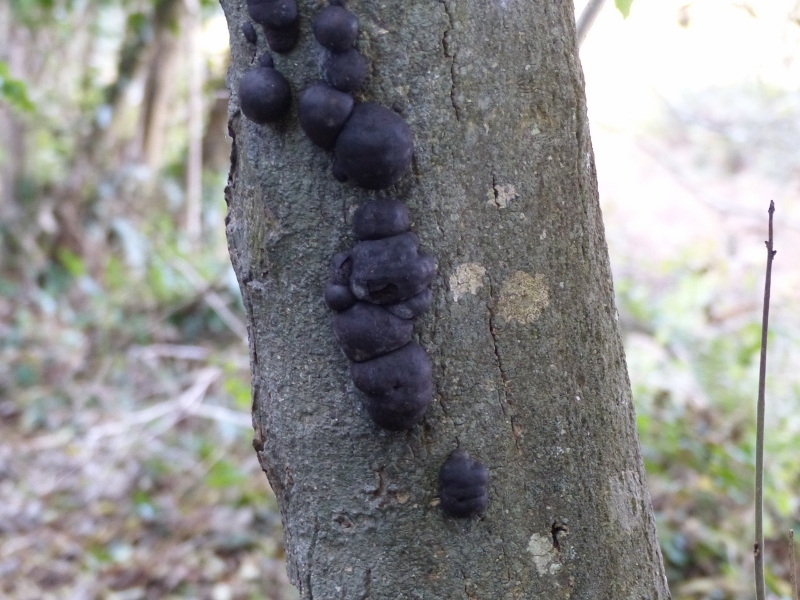 We were sorry to see evidence of ash die back (Chalara fraxinea) on some very young trees but, this autumn this fungal disease has been appearing in woods across the Island and looks set to become a feature of ash trees everywhere in the future. Our main autumn foray was based at Jersey Camp, courtesy of the MOD. Unfortunately, we did not have the benefit of our mainland experts this year. 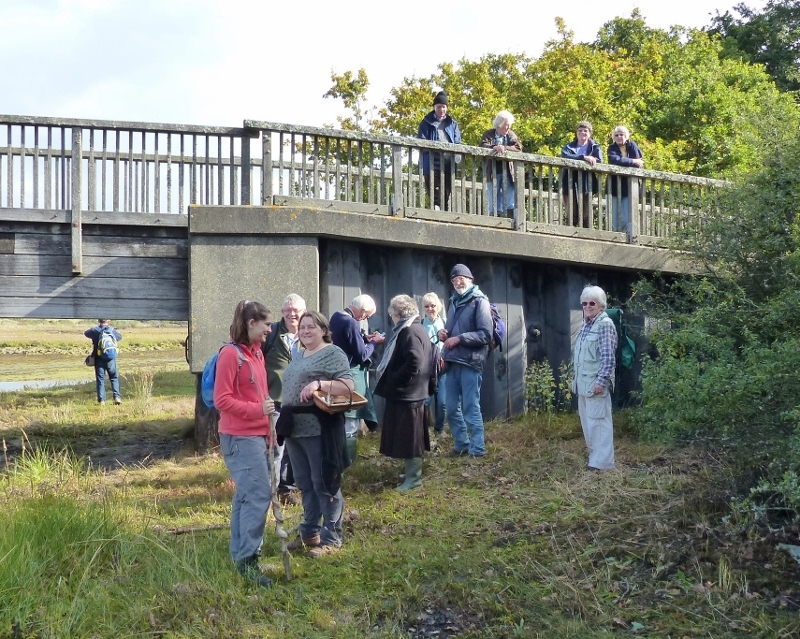 Alan Outen was unable to come down and the Hampshire Group were busy with events to celebrate National Fungus Day. 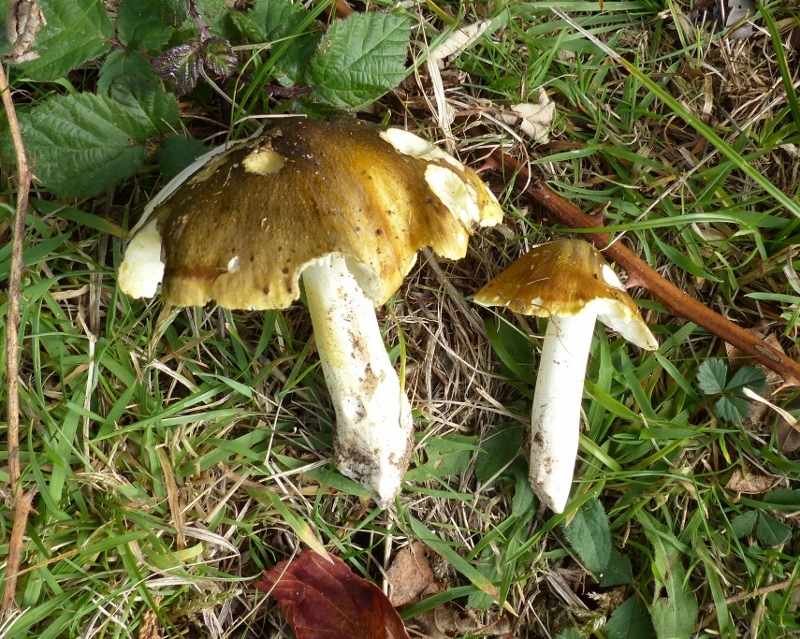 Moreover, the weather had been very dry and we struggled to find many toadstools. 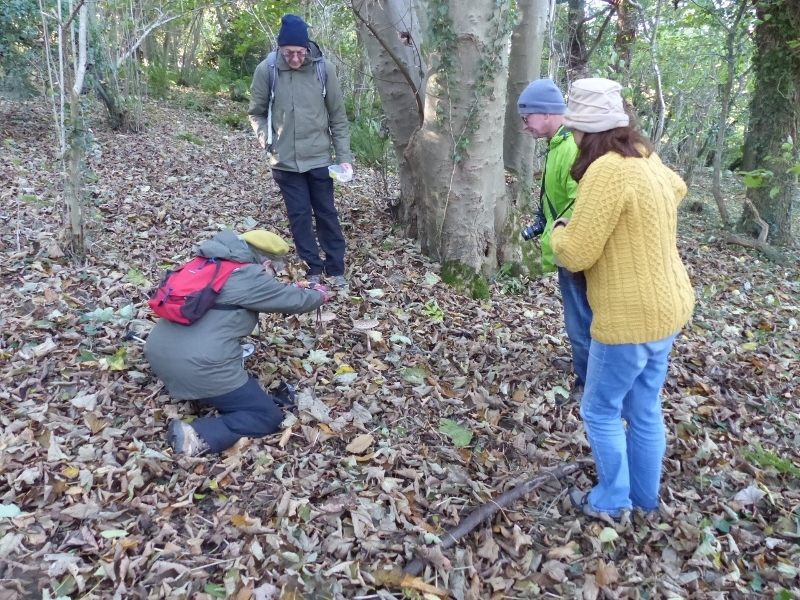 Despite this limitations, the weather was good and our group of 18 included, as always, some excellent fungus finders. 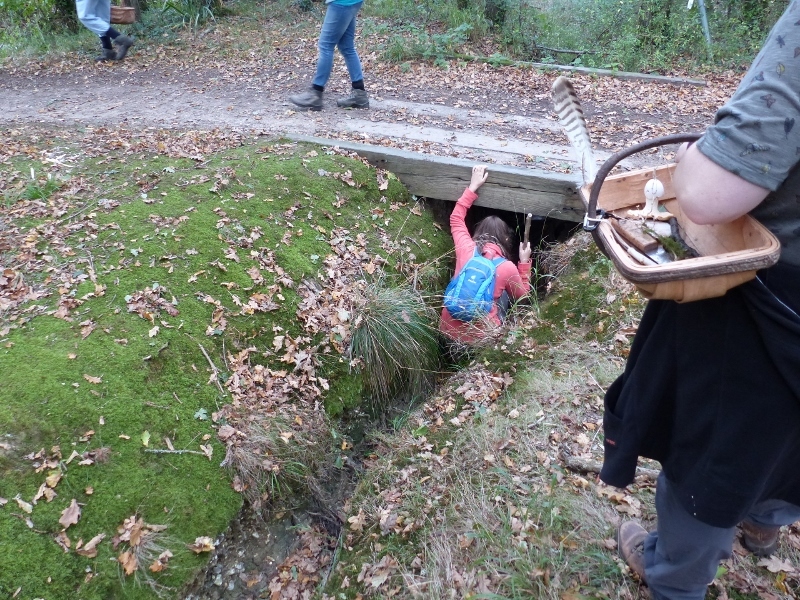 Natalie discovered some fungi in unusual places! We were able to identify a total of 59 species. After lunch, we proceeded across the meadows to Robin Wood, but found that it was too overgrown to survey and we found very little. We then proceeded to the National Trust Walter’s Copse at Newtown. This proved to be damper and we started to make good finds until a very heavy downpour brought proceedings to a rapid halt! 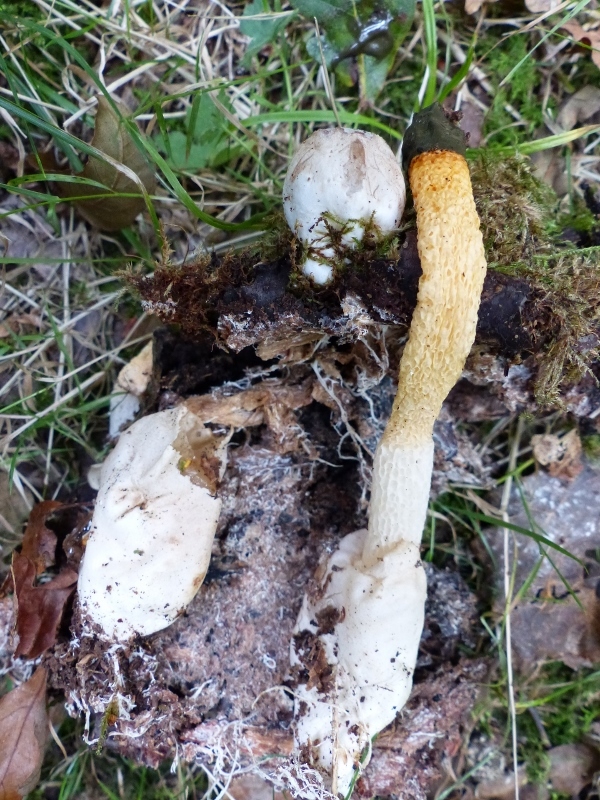 Finds included a rather slug eaten Oak Bolete, Boletus appendiculatus, (left below) with yellow pores and flesh bruising blue; the distinctive Dog Stinkhorn, Mutinus caninus; and the colourful Deceiving Knight, Tricholoma sejunctum, (right below) yellowish with a streaky cap and mealy smell. 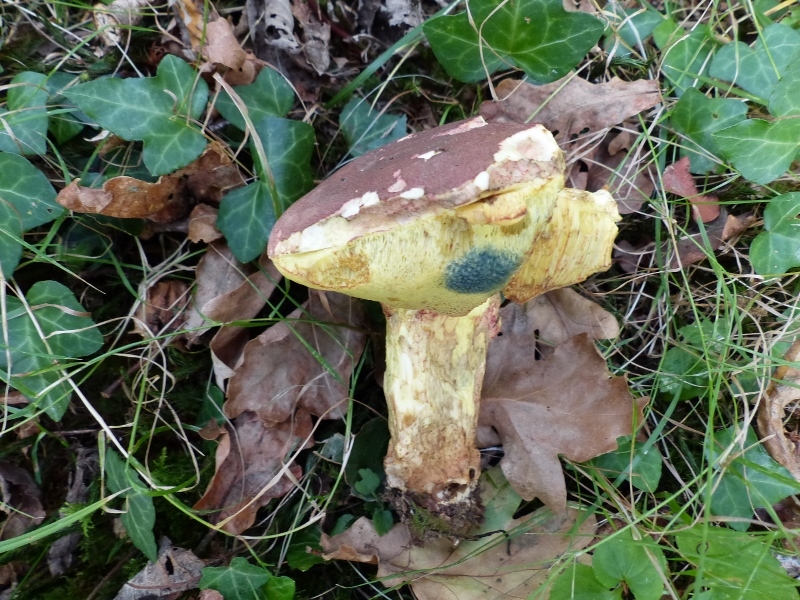 Both the bolete and Tricholoma are associated with oaks. 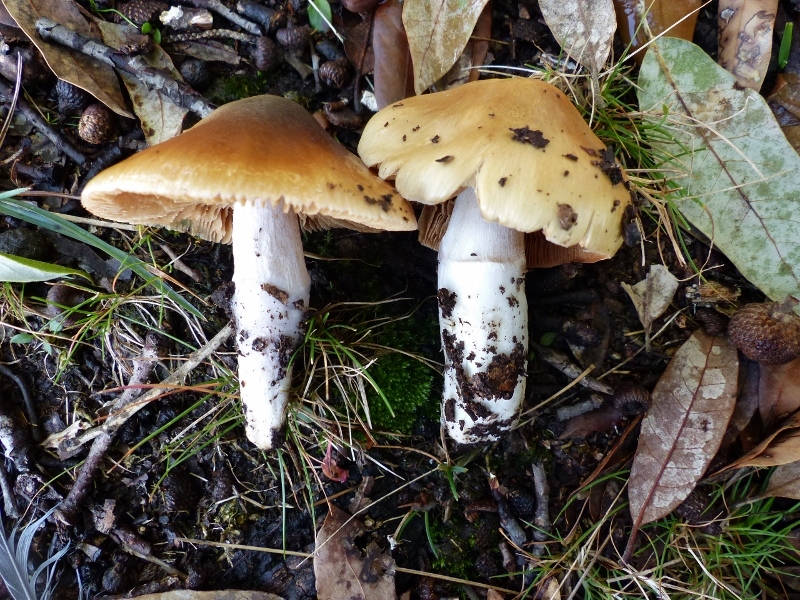 Hydropus floccipes (left below) is a small Mycena-like toadstool with dark flecks on the stipe. 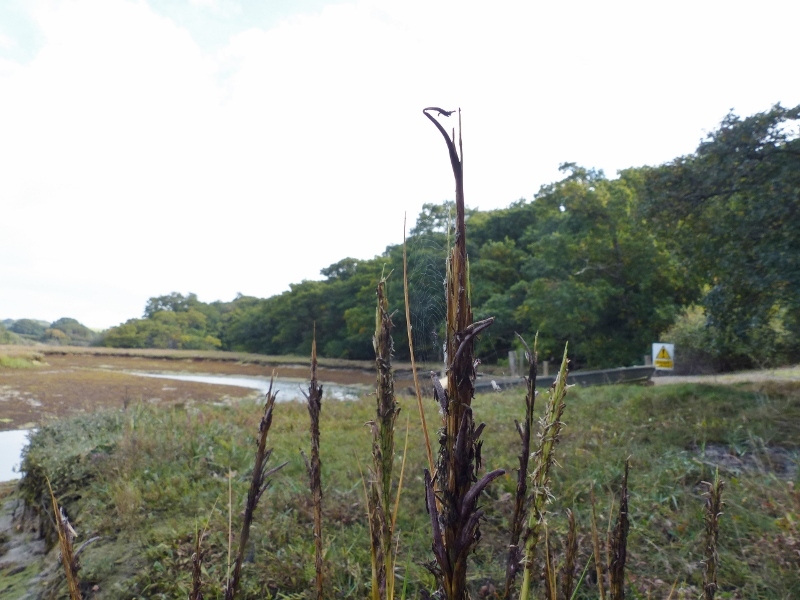 We also saw the large ergots, Claviceps purpurea (right below), blackish banana-shaped sclerotia developing in the flowerheads of Spartina grass on the saltmarsh. Ergot is very poisonous, entering the food chain via cereals; it has been suggested as a cause of recorded bizarre behaviour of ‘witches’ in the Middle Ages. 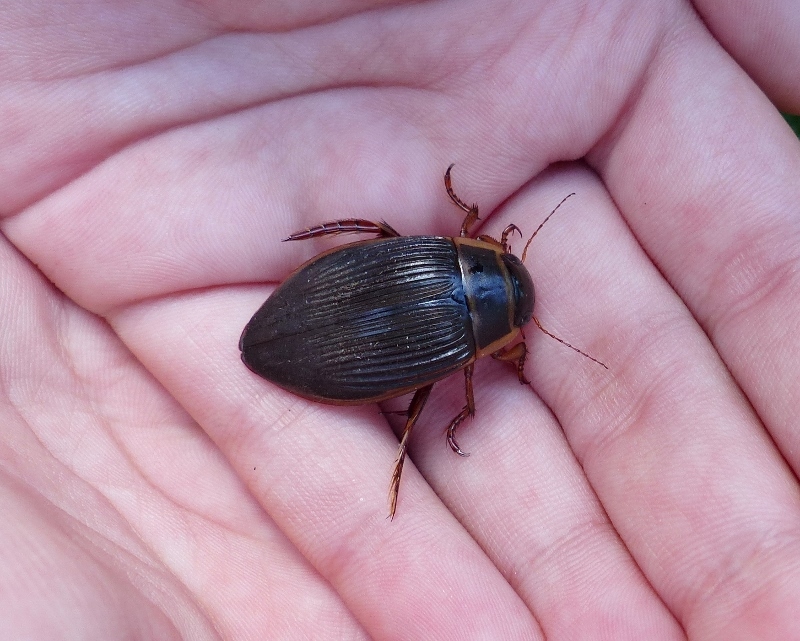 A non-mycological highlight of the day was a splendid specimen of a female Great Diving Beetle, Dytiscus marginalis, brought along by Stephen Palmer. It had been attracted to his moth trap overnight. 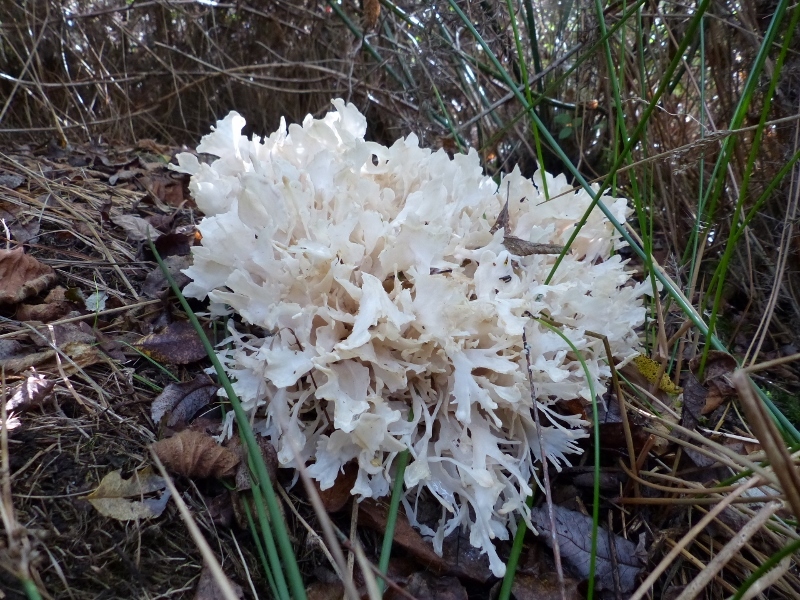 Soon after leaving the car park on the Squirrel Trail, we found two very fresh specimens of the Cauliflower Fungus. 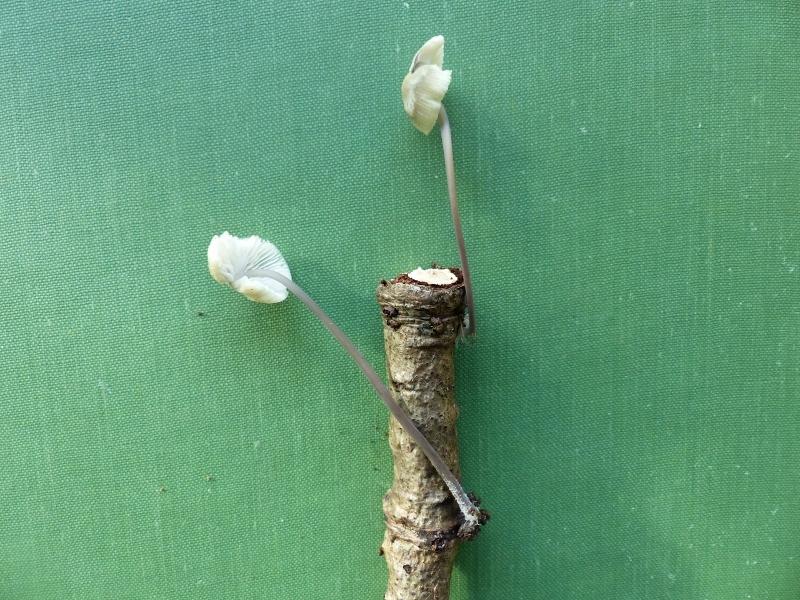 However, this was not the commonly found Sparassis crispa but the much rarer Sparassis spathulata (also known as S. lacunosa) which has a much more open, looser structure. It has been previously recorded from Parkhurst Forest in 1997 by Derek Reid. There was a good showing of the rare tooth fungi in their usual location. All the specimens we saw were the Velvet Tooth, Hydnellum spongiosipes. 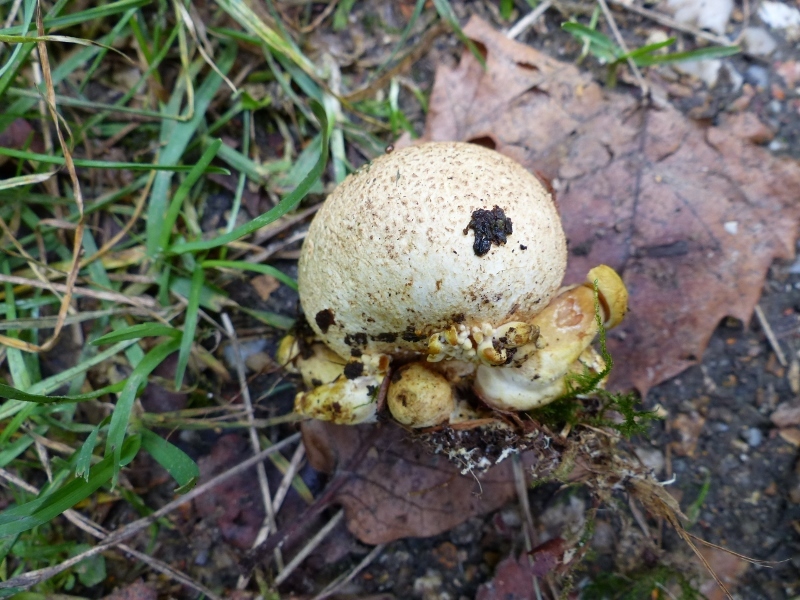 Beth discovered a glade full of Common Earthballs, Scleroderma citrinum, a common enough fungus but we had never seen some many large specimens and such quantity before. 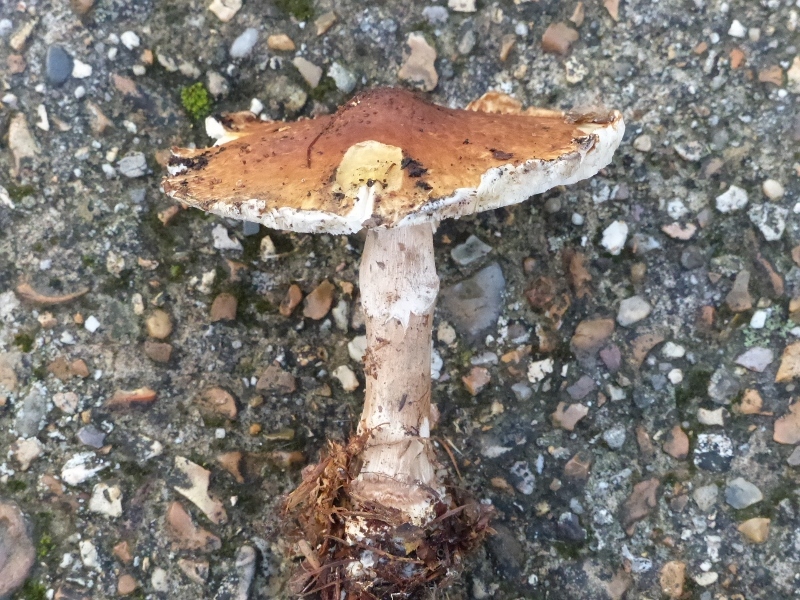 One specimen was parasitised by the Parasitic Bolete, Pseudoboletus parasiticus.